Please note there may be some spoilers in for Path of Radiance! 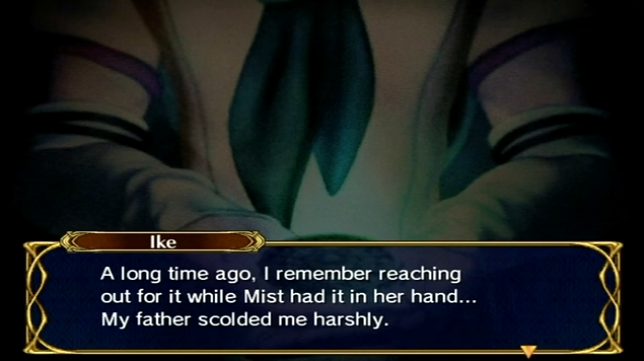 In the English version of Path of Radiance, when Ike tried to touch the medallion, he says his father “scolded him harshly”. Remembering your article about the Shiro slap scene, I became curious and checked the Japanese script. I don’t know Japanese, so I checked Google translate. I honestly don’t know what I expected to find, but I was shocked and horrified that it looked like the “harsh scolding” was originally a bad beating. Maybe I’m just in denial, but I know Google translate is not all that reliable, so I hope you can confirm it for me. The “Shiro slap scene” they mention is in reference to this previous comparison about Fire Emblem Fates. The short answer: Yes, Greil did strike Ike in some way in Japanese. For details, let’s take a look at the dialogue! The scene in question is in Chapter 19 of Path of Radiance (Entrusted). It occurs in the post-battle dialogue scenes before the end of the chapter. I’m finding all of this a little hard to believe. You said the medallion was “an object of great peril,” didn’t you? Then why would my father allow Mist to carry it around? That doesn’t make any sense. It’s because she can carry it safely. Actually, she’s the only one who can. If you want proof, think back. Have you ever once touched it? …No. I haven’t. 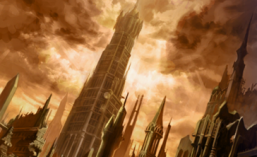 A long time ago, I remember reaching out for it while Mist had it in her hand… My father scolded me harshly. After that, I assumed…it was my sister’s alone, and I never reached for it again. Compared to other people, the balance within your sister is extremely strong. Your mother, it seems, was the same. That’s why they could bear it safely. The medallion is like a strong poison. It takes the worst aspects of a person and magnifies them a thousandfold. Greil touched it only once, and it drove him to complete madness. From the literal translation, you can see that the localization is completely accurate, minus the line in red. The word Ike uses, 殴る (naguru) is a verb that means “to strike, hit, beat, or punch.” He uses it in passive voice, so would become “was struck/hit/beat/punched by my father.” While passive voice often does not need an actor, he mentions his father directly as the performer of the action (親父に oyaji ni). So the “scolding” was indeed a beating, or at least a hit. As for “harsh,” that came from ひどく (hidoku), which means “cruel/harsh/severe/violent/etc.” It describes the beating/striking directly. With the above, we know Greil gave Ike either a single severe blow, or a series of hits that ensured he would never try to touch the medallion again. It should be noted that my translation says “severe beating” which may imply multiple hits, but it could have been a single, powerful hit. I point out this nuance simply for the record, as in English the word “beating” can mean a single or multiple hits. Like with Shiro, parents striking children is likely a sensitive topic that the localization would prefer to avoid. While it may be more acceptable in one culture, it can be problematic in others, such as parts of the Western world. Perhaps there were ESRB concerns too, and, thinking as it is relatively inconsequential to change, they opted to go the path of least resistance. Greil either scolds, or beats, Ike to express the gravity of how dangerous that medallion is. There are not many references aside from this instance of Greil doing so, which may have made it purposefully jarring (in Japanese). Ike holds unquestionable love and respect for his father despite the above in both languages, too, for those who are unaware of the context. That would imply it is, at the very least, not a regular scolding/beating purely out of abuse. It is probably why the single time we hear of it happening certainly left that much more of an impression as a result. Yes, Ike was severely beaten (or at least, severely struck) by his father Greil for trying to touch that medallion. It was likely changed to avoid delving into what could be a sensitive topic, much like with Ryoma and Shiro in Fates. The end result is the same: Ike knew to never try to touch the medallion again after that. A summary infographic for your reference! Well that does it for this brief comparison! If you have any suggestions of what else to look into that you may be curious about, please feel free to leave a comment below! This entry was posted in Comparison, Fire Emblem, Translation, Video Games and tagged beating, change, english, fe9, Gamecube, gawain, greil, ike, intelligent systems, japanese, localization, nintendo, path of radiance, scolding, Trivia. Bookmark the permalink. Thanks for the translation! I’m not surprised they changed it since corporal punishment is so looked down upon when it used to be more of a norm in the past. Thanks for reading! Yes, seemed like a pretty straightforward case. I’m glad you added this to the entry, as I’ve seen people compare Greil to an abusive parent in the past and I could just not fathom it. It wasn’t out of denial, but out of knowing Greil’s character and the love he has to both the children he had with Elena (us knowing how much he loved her–i.e. his cutting the tendons to his dominant weapon hand to never injure another in so awful a way), he would never do that to Ike or Mist. Likewise for Ike, as he loved his father unconditionally so and just the story of Path of Radiance (and even their Fire Emblem Heroes chapter and that reunion at the Day of Devotion festival and their shared Tempest Trial) reflects that. Yes, that is especially a helpful note for FE fans who may not have played these games. I would certainly not want to give an unfair impression of him! it’s hard to put it into words without supporting one side or the other, but I feel the emphasis on such a thing was that Greil cared so much for ensuring that the same fate that befell him not befall Ike in touching the thing that he would resort to even striking his beloved son to prevent it from happening. Many people love their abusers. Personally, I’ve never forgiven my parents for all the times they hit me, but I’ve always had a lot of self-love–considering how low Ike’s self-esteem is at the beginning, he probably doesn’t and just figures he deserved to be hit at the time. And for the other side of the equation, I firmly believe most abusers–especially parents abusive to their children–love their victims. They just believe (like Greil does) that “love means you have to be strict” and their idea of “strict” takes it too far. The quote you took out really bothers me because it implies that if it isn’t *intentionally* abusive it doesn’t count, but hardly anyone is *intentionally* evil. (And, for the record, corporal punishment is more associated with authoritarian parenting styles than authoritative. There’s a major difference there–both styles have high demands for their children, but authoritative style has a high warmth and responsiveness that authoritarian lacks.) I’m not saying Greil is necessarily abusive, but mutual love doesn’t rule out the possibility of abuse in a relationship. Personally I have mixed feelings about this–I believe corporal punishment is abusive because of the negative psychological effects it has on people (some of which Ike exhibits! 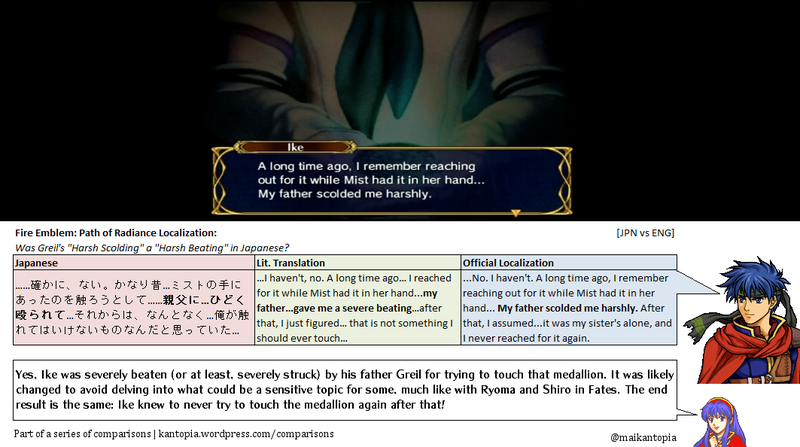 ), but the effects that would have happened if he had touched the medallion would have probably been worse… but that doesn’t mean Greil had to hit Ike to get him to understand that he shouldn’t touch it. So I think that while Greil is a mostly good person, he made a mistake here. Thank you for the comment! I’ve been editing that part of the article slightly since I felt it may come off as too simple, generalized, or forgiving, so am still trying to find a better way to put it. I think there are the cultural aspects at play here too, not that it would justify any sort of action to the target culture (and thus was changed). I think you worded it well though, generally good and made a mistake – which would tie back to just how grave he saw the potential situation. Reacted in the moment, even if there were better ways to go about it in retrospect.